Romare Bearden. 1964 Photostat Collage "Evening, 9:10, 461 Lenox Avenue" Laid on Board. Signed lower right. Cordier & Ekstrom Gallery label on verso. Condition: As is - damage along edges, stained lower left. Dimensions: 29"h x 38"w.
LARCHMONT, NY.- On Sunday, September 12, 2010 at 2:00 pm, Clarke will open its cavernous new facility with its Eighth Fine Art Auction, featuring fresh-to-market and exceptional 19th and 20th Century paintings and sculpture. Clarke's latest Fine Art Auction will again offer estate-consigned, unusual, and exceptional works from artists such as Andy Warhol; a collection of African-American works from Romare Bearden, Bob Thompson, and others; an orientalist oil by Edwin Lord Weeks, oils by Anton Huang and other Balinese artists, a Warhol collection, WPA-era American paintings, and the occasional mystery. 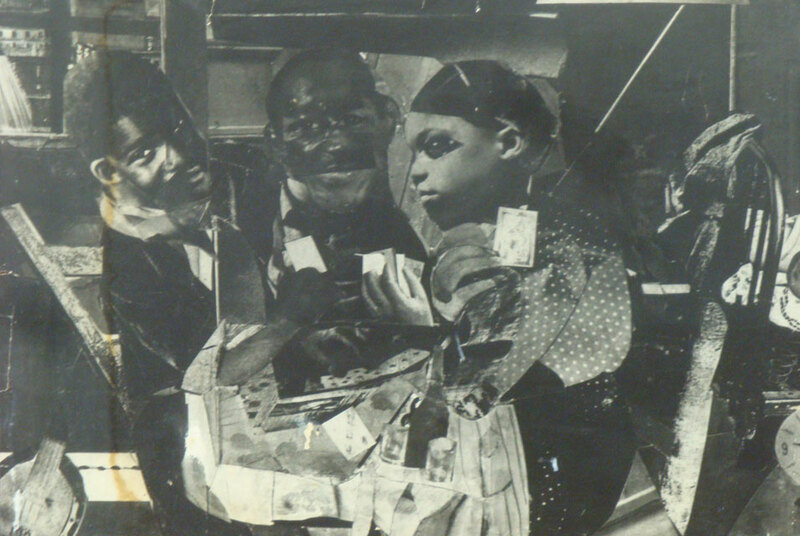 African-American art, a Clarke specialty, will feature a c.1964 photostatic collage by Romare Bearden, possibly exhibited at the Corcoran Gallery; a Bob Thompson oil, and works from artists rarely, if ever seen at auction, such as Francis Sprout, Nat Hayman, Hennessy Hydra, Walter III Cade, and Al Bright. European art includes 19th Century works from Eugene Verboechoven, Richard Wilson, John Syer Jr, Henrick Maes, Karl August Bielchowski, Ludwig Munthe, and Stephano De Albertis; coaching oils from George Wright; works from Marcel Dyf, Rudof Negely, Celeste Polychroniadi, Leonard Creo, Michel Rodde, Nathalia Goncharova, Louis Valtot, and Joseph Floch. Clarke Auction is also featuring a collection of Portugese art acquired directly from the artists, including a 1947 Julio Resende watercolor, a gouache and a large commissioned tapestry from Guilherme Camarinha, and a large acrylic by Carlos Calvet among works being catalogued. Classic American Art features works by Allen Tucker, Carroll Cloar, Seymour Thomas, W.A. Carson, Benjamin Eggleston, Paul De Longpre, James Henry Beard, Harriet Bowdoin, Carl Schmitt, multiple works by G. Glenn Newell and Gerit Hondius; Ernest Fiene, Philip Evergood, Jacob Getlar Smith, Louis Ribak and others still being being catalogued. Warholia includes works by Andy Warhol including a Geronimo color screenprint, napkins with signed Warhol drawings and accompanying Foundation documentation; and a large older painting of Marilyn in multiples, possibly faintly signed verso. Modern American Art also features paintings and sculpture by Ellsworth Kelly, Margaret Israel, George Marinko, Jan Matulka, Ann McCoy, Mary Frank, Dmitri Hadzi, Max Weber, and Mel Fowler. Founder and owner Ronan Clarke notes that "it's been ten months since our last Fine Art Auction, and we've purchased and completely renovated a great new space in which to host this sale." He adds "but our strategy remains the same - blend great fresh-to-market art with realistic estimates, few reserves, low fees - consignors and buyers will both win."